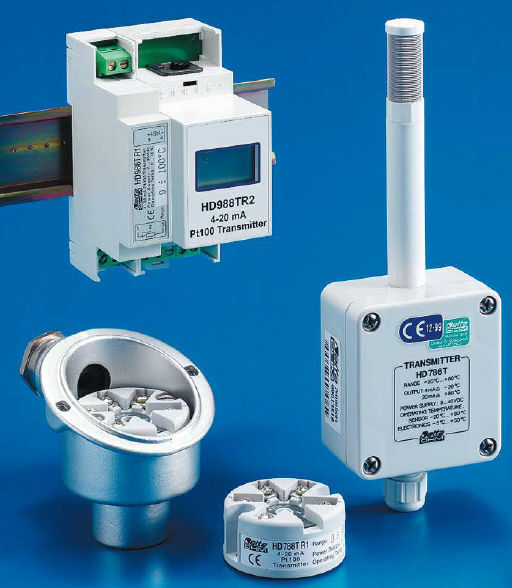 HD 788TR1, HD 788TR1-I, HD 786TR1, HD 988TR1, HD 988TR1-I and HD 988TR2 are all 4 to 20 mA configurable transmitters designed with microprocessor for Pt100 Platinum temperature sensor. The modules are used to convert the temperature variations generally found with any standard Pt100 sensor (100Ω at 0°C) into a linear current signal with two leads in 4÷20 mA field. The linearization occurs with digital technique to obtain superior precision and stability. The users can flexibly set 4÷20 mA output (or 20÷4 mA) in any required temperature range within the field -200...+650°C using 25°C minimum amplitude. The set can also be reprogrammed simply by the press of a key without regulation of any jumpers, potentiometers, software, etc. The module is equipped with LED to indicate during emergency situations (temperature outside the set range, broken or short-circuiting sensor) and support the user during programming phase. The 4-20mA output of models HD788TR1-I and HD988TR1-I are galvanically isolated from the Pt100 input.